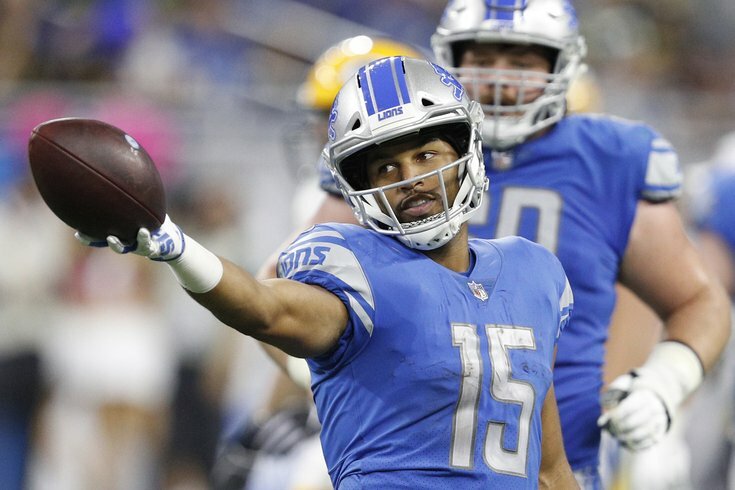 The Eagles have acquired wide receiver Golden Tate from the Lions. Golden Tate said he was at a doctors appointment just before he found out he was traded to the Eagles yesterday afternoon. "My mouth kinda dropped," Tate said, anxiously addressing reporters Wednesday afternoon a day after being swapped for a third round pick. "I read all the articles, I followed along, I think I knew before my agent." Leaving Detroit, Tate hopped on a flight to Philadelphia and — as Eagles fans have proven without a shadow of a doubt over the last year or so — experienced the true "everywhere-ness" of Birds fans. "I was actually on a flight with about a dozen people who had a layover from London," Tate said, referring to a few of the thousands of Philly fans who attended the Eagles win over Jacksonville at Wembley Stadium last Sunday. Tate says he already likes Philly fans. "I met one guy, he went to the game, he cheered loud, [on the plane] he was talking to everyone and said 'I know them from the game.' I am the kind of player who is emotional, I am proud to be a part of a fan base that supports all its sports." Tate, during his press conference, said several times he was enthused to be joining the defending Super Bowl champs and intended to be here for more than eight games (be that as an Eagles in 2019, or in a playoff run). He said he was welcomed immediately by the Eagles fans on his flight, one of whom helped him prepare for his employment in the city of Philadelphia. "I actually sat in the wrong seat on the plane out of pure excitement," he recalled. "It was next to a guy who worked for the [Department of Revenue]. He pulled out his phone, looked at me, looked at his phone again and finally struck up a conversation and we wound up talking the majority of the flight and what I learned is in Philadelphia there is a four percent wage tax. He urged me to fill out the exemption form since half our games are on the road so I wont have to pay it then." He's right. It's called the "jock tax," and Philadelphia has one of the highest in the country. For those wondering, the wide receiver will earn a pro-rated $3.7 million during his half-season in Philly before becoming a free agent in March. Between now and then, Tate will need to take a crash course in all things Philadelphia during the bye week, ahead of a date with the Cowboys on Sunday Night, Nov. 11. "I always knew that Philadelphia the city is super passionate about everything they do, especially the sports teams. I don't know much about Philly but I have a feeling I am going to learn quickly."